Wow, this is beautiful no matter what breed the dog is. The flowers do look like cosmos to me too, bot then I am not an expert. Thank you Kindly 🙂 Big smiles.. 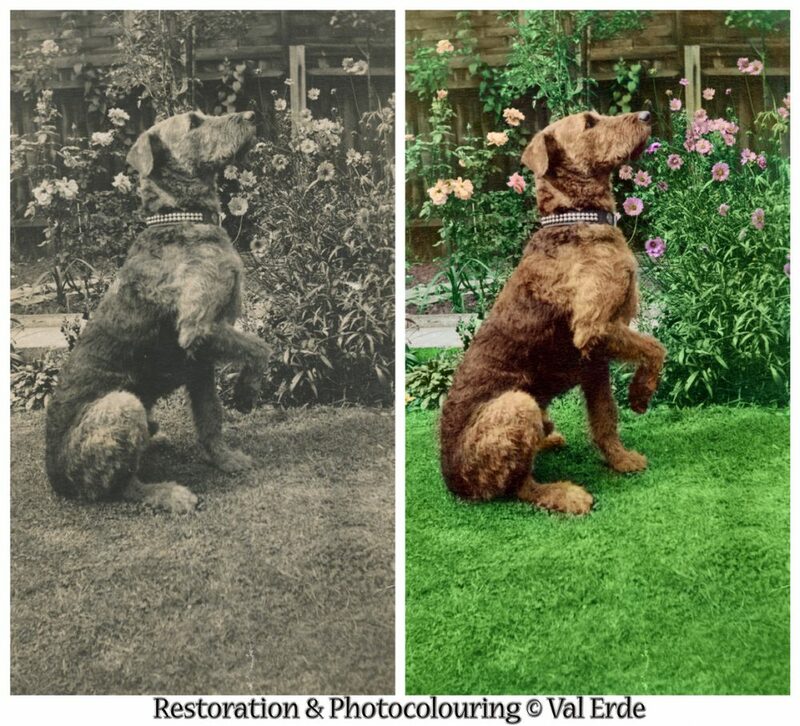 I think the colouring looks very authentic … could it be an Irish terrier? Or at least the body of an Irish terrier? Cosmos, yes, but as you say, the leaves are not right, how about a kind of Lavatera? Thanks! It does look like it has a bit of Irish terrier in it, doesn’t it? The flowers do look like Lavatera but the ones I’ve seen have different leaves. If you click the photo a couple of times, you should be able to see it a bit larger, in case that helps. It’s incredible to see how old photos can be restored like this, I always think it’s amazing and very talented! No ideas on the dog I’m afraid, but it looks like a mix of a few that I now can’t think of the names of (maybe terrier in there somewhere). Will check out your blog now, Val. 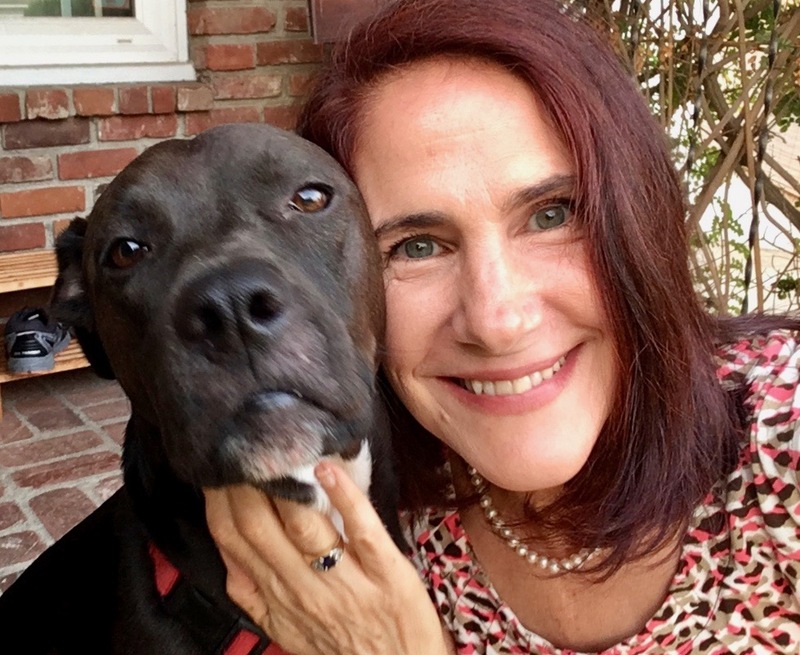 Great guest post share da-AL! Probably a terrier of some sort in there. Glad you’ve enjoyed this post and I hope you enjoy my blog, thanks! I’ve been one of Val’s fans, too, and in addition to the skillful job she does, the detective work, identifying the scene and it’s time, is really intriguing. It’s a delightful dog. I’d say it has a portion of Airedale in its lineage. I see that Airedale is a sort of terrier, which supports the suggestions others have made. The tight, curled coat, especially noticeable on its haunches, was what caught my eye. I think it’s well done, and that the dog, especially, is fine work. Airedale came to my mind as well. Thanks, Linda. Yes, I’ve just been looking at photos of Airedale crosses and there certainly are some that are similar. My thought is that as well as a pet this dog might have (unfortunately) been a gun dog – particularly if it the photo originated in England. What it doesn’t have that a purebreed Airedale has are the straight end to its face and snubby nose and much more bulky-looking legs. It looked Airedale-ish to me too, with possibly some Pointer. It’s pointing very nicely, anyway! Ah – Pointer, that’s one of the dogs I was trying to remember, thanks! Delightful post. I don’t know the breed of dog or the type of flower but I do notice that the dog has a very well hidden tail. You must be glad that you doggedly pursued this. If ever there was a photo begging to be colored, it was this one. It has all the right ingredients- great looking airedalish type dog, of warm brown in color. And yes, the photo is so interesting because the dog is striking a pleasing, begging pose. Great job, Val. I love well composed black and white photos – they convey an emotional quality not as available in color images. But sometimes black and white are just a gray blob, as is the one of the pup. Val’s thoughtful color contribution makes the photo come to life. Now we see the dog and its adorable charm in contrast to the background. His fur is a wonderful warm, rich brown, making him look cuddly and loving. If I could make one small suggestion, since you said you planned to work on it again: perhaps soften the grass color a bit. Yes, good idea about the grass. There is actually a lot more work to do on this, including making the colours and tonality of foliage and the flowers more natural, and picking out more detail from the background through the leaves and blossoms on the right. Thanks! computer things are difficult — I wonder if perhaps mine has changed the color? All computer monitors show variations in the colour we see, Daal, please don’t worry about it. 🙂 There are two desktop computers in our house plus a tablet and they all show different variations of the same colours! In fact, when I had my current pc repaired, when it returned it had lost all its custom colour settings so I had to keep checking the colours with my tablet! It’s okay – mostly. I just do a sort of average. What a gorgeous rendering–if I hadn’t seen the B&W version, I would never have realized it wasn’t originally in colour! Beautiful reproduction! The dog looks like a Labradoodle to me, but not sure if that breed was around back then? I say this as the dog is similar to my sister’s dog. I’m hopeless at post-production and don’t really like it either, so do very minimal on my photos. Thank you! No, labradoodles weren’t around at that time, but I know what you mean!